We’re working towards community equity through personal wellness, meaningful work, and generating opportunities to build community wealth. 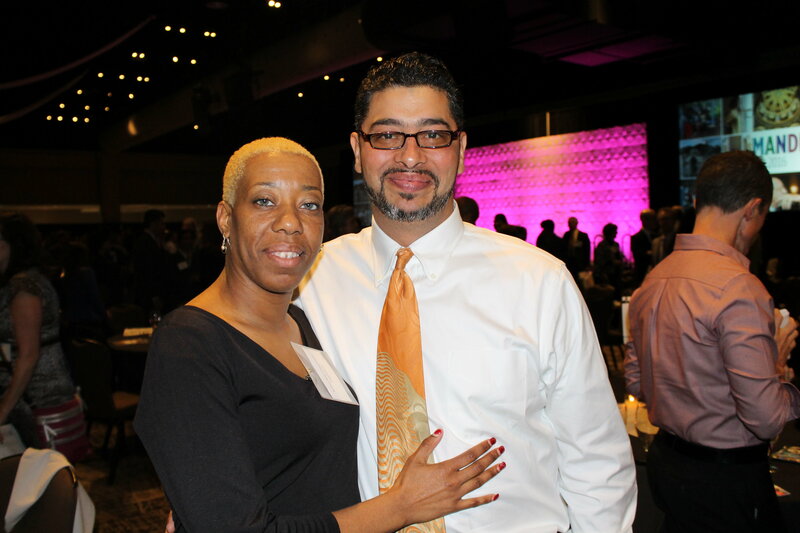 Read Tony’s story of commitment and transformation through work. “The peach trees were planted without machinery, grassroots style, in a vacant lot on N. 17th street,” said Tony. Tony watched the peach trees grow over the years. They eventually started to produce fruit. He also noticed different activity happening in the neighborhood such as the new Ezekiel Gillespie Park on N. 14th and Wright St. that was being created by a partnership of Walnut Way’s Blue Skies Landscaping Project and Home/GrownMKE. Meanwhile, his kids were actively involved in children’s programming offered through Walnut Way (e.g. Growing Youth Leadership, 4-H Clubs, Art at the Heart). Tony, his wife, and eldest daughter would often help out as chaperones or demonstrate their cooking skills during youth nights at the center. There was a new buzz in the neighborhood, and not just from the honey bees that were pollinating the peach trees and making honey. 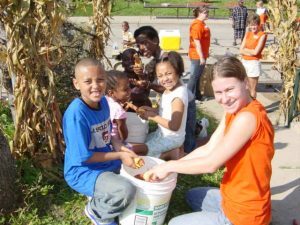 A blast from the past – Tony’s kids husk corn at Harvest Day. Tony’s position with Blue Skies Landscaping has solidified his commitment to Lindsay Heights. “As a young man, I used to tear up these streets,” recalls Tony. “But today I am building them up.” In the past several years, Tony and his family have seen many new developments sprinkle around Lindsay Heights, from Sunshine Park on the corner of 14th and North Ave. to the new America’s Black Holocaust Museum and The Griot Apartments on N. 4th and W. North Ave. Tony is proud of the projects and companies that are working with Walnut Way to transform the neighborhood, like CG Schmidt and Greenfire Development. His work with Blue Skies has transformed his life in ways far beyond his immediate family: he and his wife – both of whom are known for their cooking skills – regularly prepare and share large meals with neighborhood kids. Tony is also very active in Walnut Way’s Men’s Wellness Network – both as a mentor and as an award-winning regular participant in the “Dad’s Who Cook” competitions. He took first place in 2016 for his stuffed peppers and 2nd place in 2017 for his baked ribs. “I’m glad that I get to work in the neighborhood and that my kids get to grow up here and benefit from our tight community, just like I did when I was young,” says Tony. Through programs like Blue Skies Landscaping, Walnut Way is giving residents like Tony the power to transform their neighborhood – as parents, mentors, and workers. You can help too. Please donate generously to support Walnut Way’s life-changing programs.